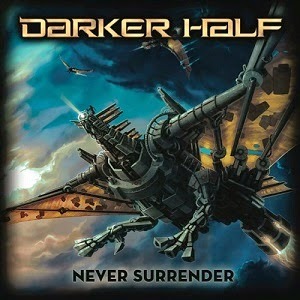 Though it might just be my first taste of this Sydney, Australia-based quartet, "Never Surrender" is actually album number three for Darker Half. Formed in 2003 (with a debut demo entitled "Rush" arriving the very same year) the band would go on to release an EP in 2006 ("Enough Is Enough") before issuing another demo in 2008 by way of "Promo 2008". In 2009 Darker Half (at the time apparently more of a thrash act then their 3rd full-length release might suggest!) issued their full-length debut album, "Duality", following it up with national tours supporting both Paul Di'anno (ex-Iron Maiden) and Queensrÿche! Now (skipping ahead a bit and all) here it is 2014 and thanks to the fine folks at FullBlast!PR I was able to spend a good part of my weekend in the company of what has proved to be a very talented power metal outfit! "Never Surrender" is one of those enjoyable albums where nature assumes a near perfect balance. The past is taken into account thanks to the presence of early heavy metal bands like Iron Maiden and Judas Priest (as well as other older influences ranging from Grim Reaper to Merciful Fate) as well as mid-nineties power metal (specifically Germany's Angel Dust!) while the present day aspects of Darker Half's metal is represented in grand fashion by morphing together any number of high class German/European melodic power metal acts (of your choosing! ), dividing it by equal portions and then doling it out to each band-member in order that they have the proper mindset/skill-level to deliver high-quality, quirk-free traditional heavy/power hellfire! Listening to this lot tear through "Never Surrender" as effectively as they do makes you realize that there is a excellent reason why Darker Half has emerged as one of Australia's top metal acts! Darker Half is a band that captures your attention early on and between Vo Simpson's maniacal voice and some killer lead solos it holds you tight in it's grip and never lets up! For those who love heavy/power metal with tasty lead guitar work and pounding rhythms a band like this almost certain to provide a daily source of metallic satisfaction! If more and more bands like Darker Half can continue to (sporadically) pop up across this world-wide globe of ours then there is little doubt that the power metal scene as a whole will be in tip-top shape for a long time to come!